Background/Aims: Proton pump inhibitors (PPIs) are widely used for the treatment of acid-related gastrointestinal diseases. Recently, some studies have reported that PPIs can alter the gastric mucosal architecture; however, the relationship remains controversial. 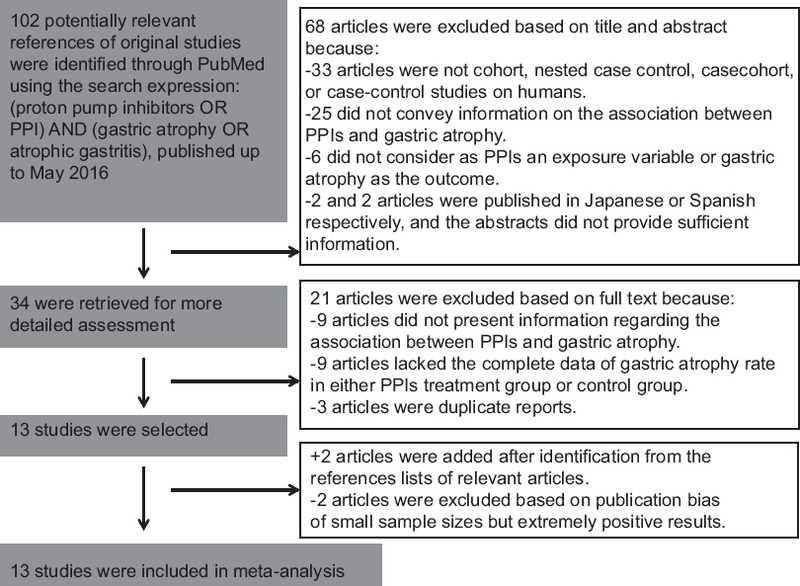 This meta-analysis study was designed to quantify the association between long-term PPI administration and gastric atrophy. Materials and Methods: A PubMed search was conducted to identify studies using the keywords proton pump inhibitors or PPI and gastric atrophy or atrophic gastritis; the timeframe of publication searched was up to May 2016. Heterogeneity among studies was tested with the Q test; odds ratios (OR) and 95% confidence intervals (CI) were calculated. P values were calculated by I2 tests and regarded as statistically significant when <0.05. Results: We identified 13 studies that included 1465 patients under long-term PPI therapy and 1603 controls, with a total gastric atrophy rate of 14.50%. There was a higher presence of gastric atrophy (15.84%; statistically significant) in PPI group compared to the control group (13.29%) (OR: 1.55, 95% CI: 1.00–2.41). Conclusions: The pooled data suggest that long-term PPI use is associated with increased rates of gastric atrophy. Large-scale multicenter studies should be conducted to further investigate the relationship between acid suppressants and precancerous diseases. Recent studies have suggested that long-term treatment with PPIs may accelerate the development of atrophic changes of the gastric mucosa, especially in H. pylori-infected individuals. Those taking PPIs without H. pylori tend to have normal gastric mucosa, whereas those infected with the organism show changes ranging from mild to severe corpus atrophy. Thus, the histological effects are not a result of treatment with the drug itself but rather a consequence of infection. Nowadays, the long-term safety of these drugs has been extensively evaluated but not entirely established. Previously, there have been several studies addressing the relationship between long-term PPI use and gastric atrophy. Interest in this phenomenon has been boosted by the possibility that the widespread and indiscriminate use of PPIs may expand the infected population at risk of developing gastric cancer. Some studies have reported positive associations,,, while other studies have produced null results,,,,,,,,,, and none have suggested an inverse relationship. Moreover, increased corpus gastritis and a decrease in the activity of antral gastritis have been suggested as a consequence of long-term treatment. To gain a better understanding of whether maintenance treatment of PPIs results in a different gastric mucosal atrophy compared to controls, we systematically reviewed the published studies and conducted a meta-analysis. 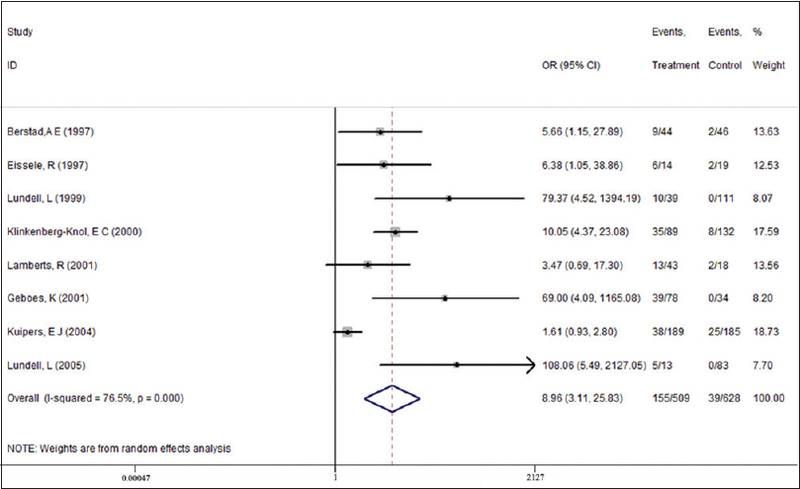 The PRISMA guidelines for conducting meta-analysis were followed. A comprehensive search was conducted by two investigators (LZ and WC), using a combination of MeSH and free text terms incorporating the population, intervention and outcome, and the third investigator (FJ) confirmed and agreed with the result. The three investigators worked independently, at different times, and at different medical science information centers affiliated to the third affiliated hospital of Soochow University. The search strategy was as follows: PubMed search using the key words proton pump inhibitors or PPIs and atrophic gastritis or mucosal atrophy. The search was repeated several times. The last search was conducted on May 1, 2016. The relevant articles texts and reference lists were manually searched to broaden the scope of our findings. We evaluated the full-texts of papers published in English. No language restrictions were used. If the papers were in an other language, English abstracts were used. When further information was required from a potentially relevant manuscript, the corresponding authors were contacted by the reviewers. Studies in which gastric mucosal atrophy was confirmed by endoscopic assessment or mucosal biopsy. The three investigators who performed the literature search also independently performed data extraction. The first authors, year, and country of publication, study type, type of specimen, sample size were recorded for each included study. The numbers of patients with mucosal atrophy in the PPI group and the control group were collected. 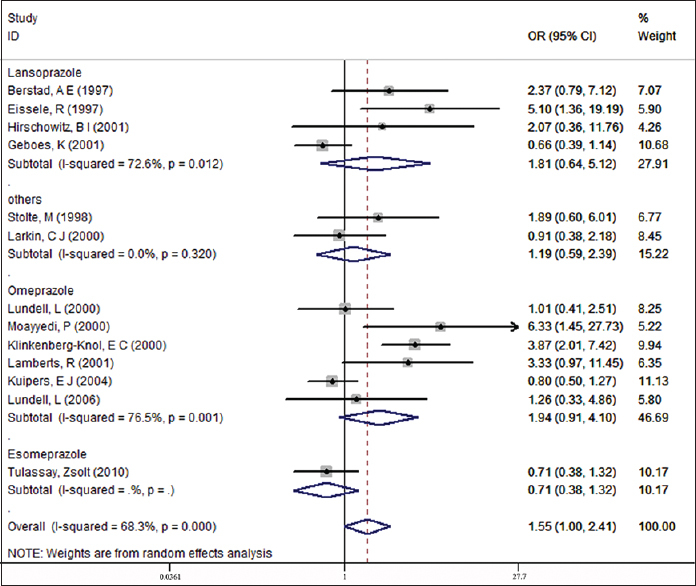 When data from one study was reported in more than one manuscript, only one was selected for the meta-analysis, according to the following criteria (applied consecutively): (1) availability of adjusted odds ratio (OR) estimates for diabetics and non-diabetics; (2) longer follow-up period (applicable to nested case-control and cross-sectional analyses); and (3) larger sample size. When the relationship between PPI use and gastric mucosal atrophy was reported in different articles referring to the same study, both were considered eligible, but only one was included in the meta-analysis. Our meta-analysis consisted of three parts. The first part was an epidemiological description of gastric atrophy rate in the PPI treatment group and the second part was a subgroup of H. pylori status in each study. The third part was a statistical pooling of the PPI treatment and gastric atrophy risk estimates. The incidence rate and the OR were the two main parameters for these studies. An unconditional logistic regression model was adopted to compare and adjust the gastric atrophy rate by two parameters: the duration of PPIs use and medicine used in each study (omeprazole, lansoprazole, esomeprazole). A McNemar test and Kappa test were adopted to estimate the diversity and consistency of the outcomes among the paired data extracted from available studies. 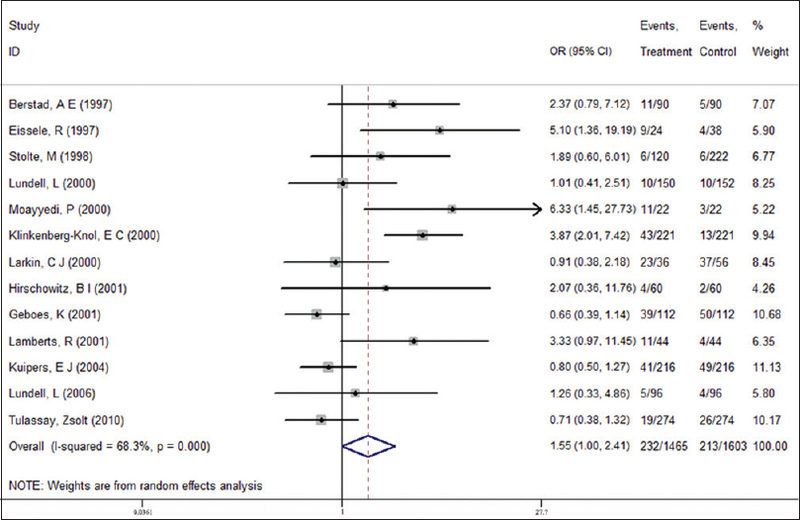 In this study, the random effects model or fixed effects model was used for meta-analysis, according to the heterogeneity between studies. Heterogeneity was tested by the Q test (P< 0.10 was considered indicative of statistically significant heterogeneity) and the I2 statistic (values of 25%, 50% and 75% were considered to represent low, medium, and high heterogeneity, respectively). The fixed effect model was used when there was no significant heterogeneity (I2<50%); otherwise the random effect model was used. P values were calculated by I2 tests. All the reported P values are two-sided, and P values <0.05 were regarded as statistically significant for all included studies. Calculation of dichotomous variables was carried out using the OR with the 95% confidence interval (CI) as the summary statistic. The Mantel–Haenszel method was used to combine ORs for the outcome parameters. Yate's correction was performed for studies containing a 'zero' value in one cell for the number of positive cases in one of the two groups. 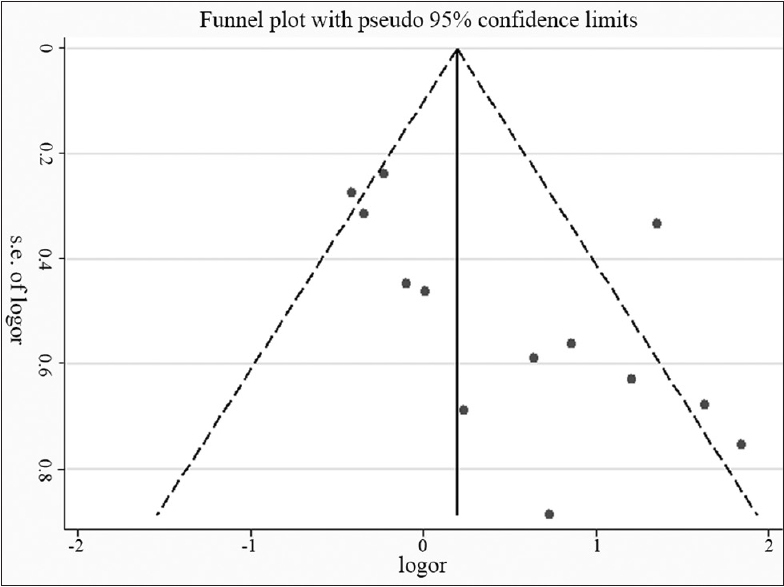 Publication bias was examined by a funnel plot of log OR against its standard error using Begg's test. The degree of asymmetry was tested statistically using Egger's unweighed regression asymmetry test. Publication bias was considered to exist if the rank correlation coefficient from Begg's test was close to 1, or the slope parameter from Egger's regression was high. Data manipulation and statistical analyses were undertaken using the Statistical Software Package (STATA) version 12.0 (STATA Corporation, College Station, TX, USA, 2011). A total of 102 potentially relevant publications up to May 1, 2016, were systematically identified through PubMed. Of these, 68 (66.67%) were excluded because they did not satisfy the inclusion criteria, or they failed to provide sufficient information to determine whether the criteria were satisfactory. An additional 21 articles were excluded because of a lack of full text, while two other articles were added after being identified from the reference lists of relevant articles [Figure 1]. There were a total of 13 studies included in the final analysis that were published between 1996 and 2010,,,,,,,,,,,, and met our inclusion criteria [Table 1]. As for the detection methods, all studies used only biopsy. The 13 studies included 1465 patients under long-term PPI therapy and 1603 controls, with a total gastric atrophy rate of 14.50%. We observed a statistically significant higher presence of gastric atrophy in the PPI group (15.84%) compared to the control group (13.29%); control group OR: 1.55, 95% CI: 1.00–2.41 [Figure 2]. Different types of PPIs including omeprazole,,,,,,,, lansoprazole,,,, esoprazole, and others , were utilized in the included studies. The pooled data showed that the gastric atrophy rate was different between the maintenance therapy group and control group possibly due to differences in the various pharmacokinetics or dosages used [Figure 3]. The subgroup analysis indicated higher gastric atrophy rates both in the omeprazole and lansoprazole groups when compared to the control groups (16.15% vs. 11.05%, P = 0.001; 22.03% vs. 20.33%, P = 0.012). Conversely, for esoprazole there was a lower rate of gastric atrophy in treatment group than control group (6.93% versus 9.48%). A subgroup analysis of nine studies that assessed H. pylori status was also undertaken [Table 2] and [Figure 4]. Among the 509 H. pylori-positive patients, atrophy of any degree was diagnosed in 155 (30.45%) patients at follow-up. Among the 628 H. pylori-negative patients, atrophy of the gastric mucosa of any degree was diagnosed in 39 (6.21%) patients at the last visit (mild to severe). The development of any degree of atrophy was strongly associated with H. pylori infection (OR = 8.96, 95% CI = 3.11–25.83). In addition, our analysis suggests a significant relationship between the presence of gastric atrophy in H. pylori-infected patients after long-term PPI use (OR = 1.72, 95% CI = 1.30–2.27). Moreover, there was a lower rate of gastric atrophy in H. pylori- negative patients after PPI maintenance therapy (OR = 0.60, 95% CI = 0.40–0.91). [Table 3]. The gastric atrophy rate in the antrum was slightly higher (18.63%) than in corpus (14.68%) (OR = 1.52, 95% CI = 0.49–4.70), gastric atrophy in the antrum had decreased (OR = 0.79, 95%CI = 0.38–1.62), but had increased in the corpus (OR = 1.14, 95%CI = 0.55–2.37). In our meta-analysis, we analyzed atrophy at different time periods of PPI therapy, although the information was insufficient to analyze [Table 4]. In the future, large-scale and multicenter studies are still needed to clarify whether more severe morphological changes occur with time under PPI use. 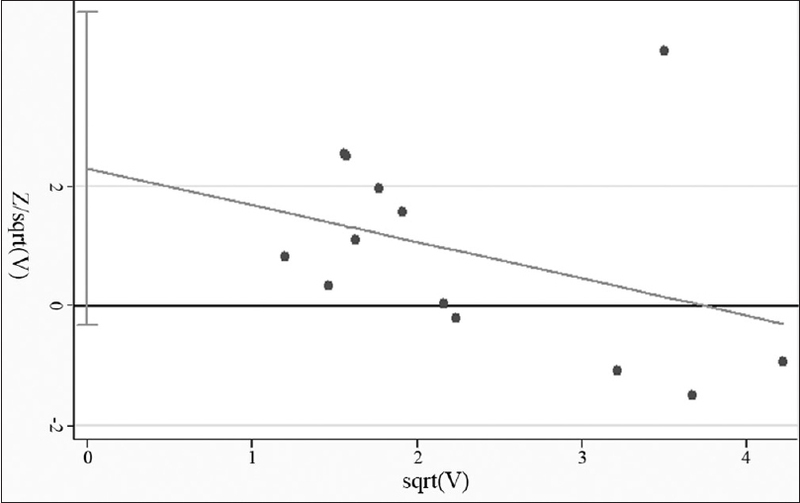 To measure publication bias, a funnel plot and Harbord's weighted linear regression test [Figure 5] and [Figure 6] were used. It suggested there was no publication bias (P = 0.008). A sensitivity analysis calculating the pooled ORs for the remainder of the studies showed that there was no heterogeneity. Clinically, the most common indications for long-term PPI use are for the management of symptomatic GERD and for prevention of non-steroidal anti-inflammatory drugs (NSAID)-associated upper gastrointestinal complications. Like several other prolonged treatments, concern has arisen regarding possible long-term effects, especially of neoplastic nature. We analyzed the published data investigating the association between PPI administration and gastric mucosal atrophy. Meta-analysis of 13 studies from across the globe suggested that the rate of gastric mucosal atrophy was higher in PPI use group than that in their counterparts. PPIs are a group of drugs whose main action is a pronounced and long-lasting reduction of gastric acid production. Millions of individuals have been using these medications on a continuous or long-term basis. In the early days of PPI therapy, there was particular concern about hypergastrinaemia in response to profound acid inhibition and resultant endocrine cell hyperplasia with possible tumor formation. Indeed, it was just such a consideration that led to the temporary halt of the clinical development of omeprazole, the first PPI, and the delay of its widespread introduction. It is perhaps due to the difficulty in conducting such studies that to date only limited data are available on changes in gastric levels or gastric mucosal endocrine cell numbers after prolonged PPI administration., It may also lead to the bias of the results. The question of whether long-term PPI treatment in H. pylori- infected patients accelerates the development of GA has been raised.,,, By comparing H. pylori-infected persons taking PPIs with uninfected persons of a similar age receiving the same treatment, we found that there was a significant increase of gastric atrophy incidence in H. pylori-positive patients. Our results suggest that patients with GERD and H. pylori infection who are treated with PPIs are at an increased risk of severe gastric atrophy. Moreover, our data found a higher prevalence of gastric atrophy in H. pylori-positive patients after long-term PPI use but a lower prevalence of gastric atrophy in H. pylori-negative patients. The role of H. pylori in chronic gastritis and peptic ulcer disease is well recognized, and further research revealed that chronic H. pylori- associated gastritis predisposed to gastric atrophy and gastric cancer. This usuallyaffects the antrum. But some patients may develop corpusatrophy. These subjects are thought to have a reduced parietalcell mass, that is, they are natural hyposecretors of acid, andso the H. pylori can find a suitable environment in the corpus, which is normally too acidic to enable survival of the bacterium. PPI treatment can lead to H. pylori colonization reduction. However, recent studies have found that corpus inflammation was significantly intensified despite stable bacterial counts. The number of neutrophils increased significantly in the lamina propria and epithelium. It has been shownin vitro that epithelial cells infected with live H. pylori secrete large amounts of interleukin-8, which has a strong chemoattractant effect on neutrophils. Continuous neutrophil activation may lead to tissue destruction. Moreover, removal of acid from the H. pylori colonized luminal surface of the oxyntic mucosa could affect penetration of bacterial toxins, especially unprotonated ammonia, through the gastric barrier, which may result in enhanced mucosal damage. Chemical modifications of bacterial toxins in a less acidic environment or deeper location of H. pylori in the foveolae could exaggerate mucosal damage. Importantly, those without known active H. pylori also may develop gastric atrophy while taking PPIs, suggesting that in some patients either H. pylori was not detected or overgrowth by non-H. pylori organisms may on occasion lead to the same outcome. It is well known that concurrent PPI treatment can cause an apparent change in the distribution of the organism with a corpus predominant colonization and result in active chronic corpus gastritis with atrophy. So we analyzed the combined results from two biopsy sites (antrum and corpus). In our study, the follow-up visit of gastric atrophy in the antrum was decreased, while it increased in the corpus. In addition, gastric atrophy incidence in antrum was (insignificantly) slightly higher than in corpus under PPIs maintenance therapy, possibly due to the small sample size and sampling error, as atrophy can be only focal. So, multiple punch biopsies of each person's stomach should be performed to improve the atrophy scores in future studies. First, the selection of the controls varied between studies, some studies involve patients who had H. pylori, while others may include patients with GERD. Second, since the papers included in the present meta-analysis were limited to those published and listed on PubMed through May 2016, it is possible that some relevant published or unpublished studies, which may have met the inclusion criteria, were missed. These overlooked studies may have corrected some inherent biases due to the study design. Third, a few of the studies used in the present meta-analysis had a small sample size that may affect the final results. In conclusion, this meta-analysis revealed an association between the presences of gastric atrophy in long-term PPI treatment patients. These findings support the notion that H pylori eradication should be seriously considered before initiating long-term treatment with PPIs. Due to the limited number of studies and their small sample sizes, further research should be conducted to investigate the possible relation between long-term PPIs use and gastric atrophy. This work was supported by the applied basic research project of Changzhou science and Technology bureau [NO.CJ20140047], and Changzhou High-Level Medical Talents Training Project [NO. 2016CZBJ046]. Vigneri S, Termini R, Leandro G. A comparison of five maintenance therapies for reflux esophagitis. N Engl J Med 1995;333:1106-10. Thomson AB, Sauve MD, Kassam N. Safety of the long-term use of proton pump inhibitors. World J Gastroenterol 2010;16:2323-30. Klinkenberg-Knol EC, Nelis F, Dent J. Long-term omeprazole treatment in resistant gastroesophageal reflux disease: Efficacy, safety, and influence on gastric mucosa. Gastroenterology 2000;118:661-9. Eissele R, Brunner G, Simon B, Solcia E, Arnold R. Gastric mucosa during treatment with lansoprazole: Helicobacter pylori is a risk factor for argyrophil cell hyperplasia. Gastroenterology 1997;112:707-17. Moayyedi P, Wason C, Peacock R, Walan A, Bardhan K, Axon AT, et al. Changing patterns of Helicobacter pylori gastritis in long-standing acid suppression. Helicobacter 2000;5:206-14. Stolte M, Meining A, Schmitz JM, Alexandridis T, Seifert E. Changes in Helicobacter pylori-induced gastritis in the antrum and corpus during 12 months of treatment with omeprazole and lansoprazole in patients with gastro-oesophageal reflux disease. Aliment Pharmacol Ther 1998;12:247-53. Lundell L, Miettinen P, Myrvold HE, Pedersen SA, Thor K, Andersson A, et al. Lack of effect of acid suppression therapy on gastric atrophy. Nordic Gerd Study Group. Gastroenterology 1999;117:319-26. Larkin CJ, Watson RGP, Sloan JM, Stevenson M, Ardill JE, Buchanan D. Distribution of atrophy in Helicobacter pylori-infected subjects taking proton pump inhibitors. Scand J Gastroenterol 2000;35:578-82. Kuipers EJ, Nelis GF, Klinkenberg-Knol EC, Snel P, Goldfain D, Kolkman JJ, et al. Cure of Helicobacter pylori infection in patients with reflux oesophagitis treated with long term omeprazole reverses gastritis without exacerbation of reflux disease: Results of a randomised controlled trial. Gut 2004;53:12-20. Berstad AE, Hatlebakk JG, Maartmann-Moe H, Berstad A, Brandtzaeg P. Helicobacter pylori gastritis and epithelial cell proliferation in patients with reflux oesophagitis after treatment with lansoprazole. Gut 1997;41:740-7. Hirschowitz BI, Haber MM. Helicobacter pylori effects on gastritis, gastrin and enterochromaffin-like cells in Zollinger-Ellison syndrome and non-Zollinger-Ellison syndrome acid hypersecretors treated long-term with lansoprazole. Aliment Pharmacol Ther 2001;15:87-103. Lamberts R, Brunner G, Solcia E. Effects of very long (up to 10 years) proton pump blockade on human gastric mucosa. Digestion 2001;64:205-13. Geboes K, Dekker W, Mulder CJ, Nusteling K. Long-term lansoprazole treatment for gastro-oesophageal reflux disease: Clinical efficacy and influence on gastric mucosa. Aliment Pharmacol Ther 2001;15:1819-26. Lundell L, Havu N, Miettinen P, Myrvold HE, Wallin L, Julkunen R, et al. Changes of gastric mucosal architecture during long-term omeprazole therapy: Results of a randomized clinical trial. Aliment Pharmacol Ther 2006;23:639-47. Tulassay Z, Stolte M, Engstrand L, Butruk E, Malfertheiner P, Dite P, et al. Twelve-month endoscopic and histological analysis following proton-pump inhibitor-based triple therapy in Helicobacter pylori-positive patients with gastric ulcers. Scand J Gastroenterol 2010;45:1048-58. Arena VC. A program to compute the generalized Mantel-Haenszel Chi-square for multiple 2 x J tables. Comput Programs Biomed 1983;17:65-72. Jacobson BC, Ferris TG, Shea TL, Mahlis EM, Lee TH, Wang TC. Who is using chronic acid suppression therapy and why? Am J Gastroenterol 2003;98:51-8. Calabrese C, Fabbri A, Di Febo G. Long-term management of GERD in the elderly with pantoprazole. Clin Interv Aging 2007;2:85-92. Bardhan KD, Bishop AE, Polak JM, Romanska HM, Rowland A, Thompson M, et al. Pantoprazole in severe acid-peptic disease: The effectiveness and safety of 5 years' continuous treatment. Dig Liver Dis 2005;37:10-22. Solcia E, Fiocca R, Havu N, Dalvag A, Carlsson R. Gastric endocrine cells and gastritis in patients receiving long-term omeprazole treatment. Digestion 1992;51:82-92. Lamberts R, Creutzfeldt W, Struber HG, Brunner G, Solcia E. Long-term omeprazole therapy in peptic ulcer disease: Gastrin, endocrine cell growth, and gastritis. Gastroenterology 1993;104:1356-70. Kuipers EJ, Lundell L, Klinkenberg-Knol EC, Havu N, Festen HP, Liedman B, et al. Atrophic gastritis and Helicobacter pylori infection in patients with reflux esophagitis treated with omeprazole or fundoplication. N Engl J Med 1996;334:1018-22. Kuipers EJ, Uyterlinde AM, Pena AS, Hazenberg HJ, Bloemena E, Lindeman J, et al. Increase of Helicobacter pylori-associated corpus gastritis during acid suppressive therapy: Implications for long-term safety. Am J Gastroenterol 1995;90:1401-6. Brunner G, Arnold R, Hennig U, Fuchs W. An open trial of long-term therapy with lansoprazole in patients with peptic ulceration resistant to extended high-dose ranitidine treatment. Aliment Pharmacol Ther 1993;7:51-5. Weiss SJ. Tissue destruction by neutrophils. N Engl J Med 1989;320:365-76. Crabtree JE, Covacci A, Farmery SM, Xiang Z, Tompkins DS, Perry S, et al. Helicobacter pylori induced interleukin-8 expression in gastric epithelial cells is associated with CagA positive phenotype. J Clin Pathol 1995;48:41-5. Graham DY, Genta RM. Long-term proton pump inhibitor use and gastrointestinal cancer. Curr Gastroenterol Rep 2008;10:543-7.